Winter is well and truly upon us now, but still the SOTA bug continues to bite! With a reasonable weather forecast and a bit of spare time on my hands I decided it would be interesting to try a Summit or two above the snow line, which would attract the 3 point winter bonus score. A look at the map suggested that Granite Mountain VK2/SW-015 and Pilot Reef VK2/SW-021 might fit the bill. 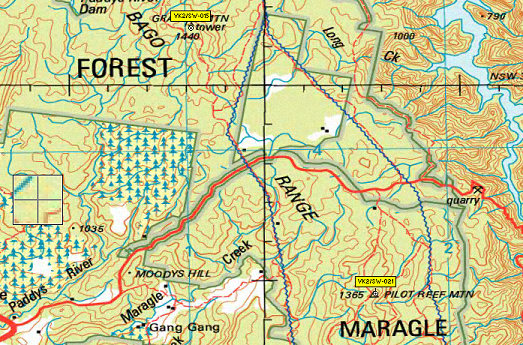 Both are reasonably close to home and both, from the map at least, appear to be accessible without hiking across too much country. Anticipating chilly conditions at altitude, my lady packed us a pot of soup and a portable gas stove on which to heat it. That would prove to be an excellent idea and much appreciated when lunch time came around. We drove up past Jingellic and on up Elliot Way to the power line road, where there is a sign pointing towards Granite Mt. We noted occasional bits of snow lying in gullies beside the road, so it had evidently been snowing up there recently but at the altitude of Elliot Way it had melted already. The power line road was muddy but clear of snow, so we made our way up to the intersection with Jimmies Rd which leads to the Summit. It was very muddy at that point but there was still no snow on the ground so we drove on, following Jimmies Rd as it climbed gently up. At about a kilometre in we crossed the snow line and from there on the snow on the trail got progressively deeper. We slid and slithered our way to the intersection where the Summit access road leaves Jimmies Rd and at that point we lost all traction on the snow and could drive no further. It was a bit of a challenge turning the Hilux around, as the weight of the vehicle compacted the snow into ice under the wheels and gave no traction at all. With a bit of shovel work I cleared enough of a space to turn the vehicle around, so we knew at least we weren’t trapped up there. We knew it was a short walk up the trail from the intersection to the Summit, and in fact the intersection itself is within the activation zone so we had a couple of options for activating this one. While we were mulling over the best option it started snowing, just light stuff drifting down through the trees but enough to make me worry about the state of the trail lower down. We didn’t want to get stuck up there! So we decided that discretion was the better part of valour and beat a hasty retreat without activating the Summit. Going downhill was much easier than going up had been, with far less slithering and sliding. We just followed the wheel ruts, which were quite deep in places and very wet and muddy. 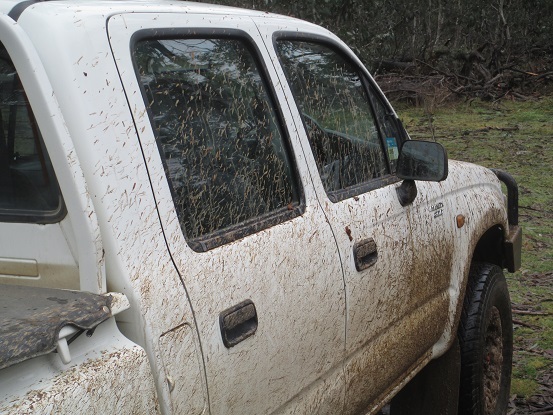 The Hilux got a thorough coating of mud that would require some serious attention in a car wash when we got back down! By this time we were feeling hungry and so we decided to head down to Sue City, down on the Talbingo Reservoir, where we could set up the stove on a picnic table and heat up our soup. The hot soup followed by a cup of hot tea was very much appreciated and fortified by our lunch we got out the map and considered our next move. In view of our experience attempting to access Granite Mt we though it unlikely we’d be able to reach Pilot Reef, but we decided to go up and take a look anyway. 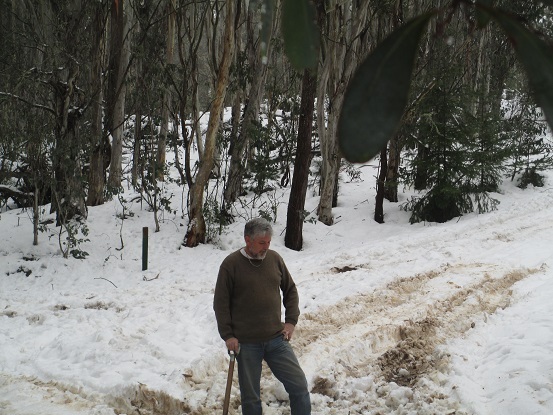 We agreed that if the snow was as heavy across the trail as it had been on Jimmies Rd we would abandon the attempt. As it turned out, all of the trails heading towards Pilot Reef were closed and so the attempt never got started. All was not lost though. 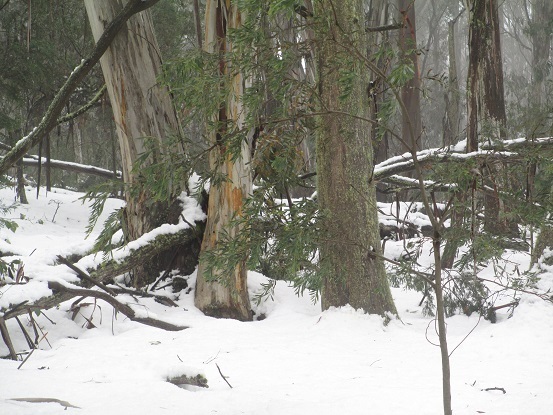 This expedition showed us what conditions can be like in the snow, and also gave us some valuable reconnaissance for another expedition up this way when the snow has gone. It snows in the high country in winter! Even when there’s no sign of snow lower down, expect it if you’re going higher than a thousand metres or so. Snow compacts into ice under the weight of a vehicle, and there is little or no traction on ice. Don’t attempt to drive on fresh or compacted snow. You won’t get far. Don’t take risks. An expedition on which you get trapped in the middle of nowhere in the high country in winter is likely to end badly. If in doubt, chicken out! That way there will be a next time.